Have you been searching for an honest and updated review of Prizerebel and wondering just what exactly this survey panel is all about? Perhaps this has landed in your inbox or landed in your newsfeed and you’re wondering what this is all about and whether or not it’s a scam? I have actually received a lot of emails requesting that I write an in-depth and honest review of this survey panel so that they know whether or not it’s worth their valuable time or not. Since I have already had this site on my list of programs to review anyway, I thought, sure, why not? I have actually taken a decent amount of time out of my day to research this opportunity so you guys can expect nothing but the best and most accurate and up to date information thats available about this program. In the following review, I’ll be showing you exactly what this system is about, how it works, how much money you can earn with them, and ultimately, whether this is worth your time or not. If you have ever shown an interest in getting paid to offer your opinions via sites like Prizerebel then I think you owe it to yourself to continue reading this review in its entirety for all the juicy details. What Exactly Is The Prizerebel Survey Site? 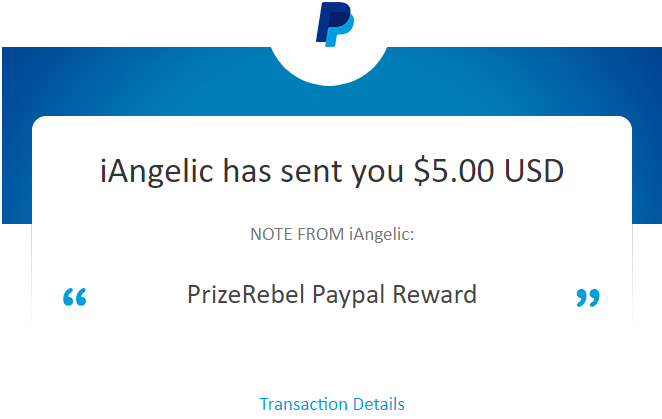 Prizerebel is one of the better survey sites out there that claim to offer you various ways to earn money with their website. The company was founded in 2007 and within that time (11 years & counting) they have constantly been searching for ways to make the whole survey experience more enjoyable. It’s actually quite funny about how this company got started and once I tell you guys the story of how this all started I’m sure that you’ll get a chuckle out of it as I did. This company was founded by a former survey taker who was overall disappointed in the number of quality survey sites available to panelists today so he set out to build his own GPT type of site to give people more options. Pretty crazy story if I might say so myself!! This survey panel is open to all US, Canada, UK, & Australia residents that are at least 18 years old or older. If you happen to be between the ages of 13 and 18 then you’ll need to get your parents permission before signing up for this survey panel. Over the past 11 years, they have focused on quality and have improved in several ways with more improvements on the way. To date, they have paid out over $17 million dollars in cash and prizes since they launched their website nearly 12 years ago. Take a look at the screenshot below to learn a little more about this company and what they have to offer you! Besides surveys, there are also a variety of other ways to generate money from this site and I’ll be going over this in complete detail so I encourage you guys to continue reading. Getting started with Prizerebel is easy and you can have your account set up and ready to start earning you money in less than 5 minutes. It’s Free To Join and once you’re inside the member’s area you’ll be presented with a screen that is similar to the one you see below. As you can see in the screenshot above, there are a variety of ways to earn money with this site besides just taking surveys. 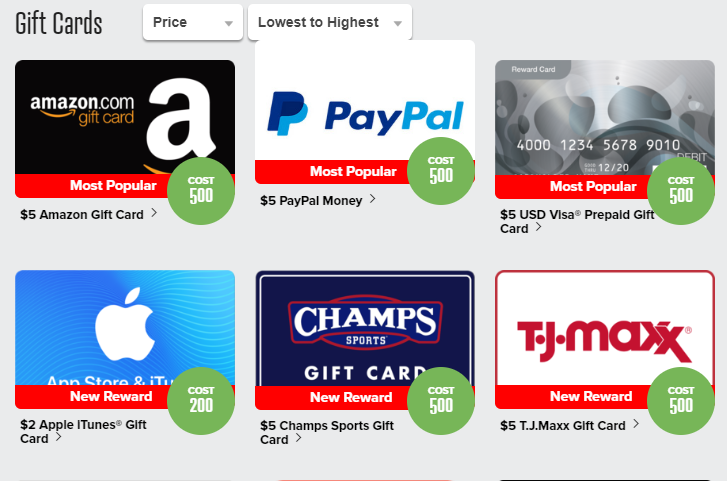 From entering promo codes for extra points to watching videos and inviting your friends, you’re sure to find something that interests you on Prizerebel. Also, after you have set up your profile with an image and fill out a few demographics about yourself you’ll instantly have 100 points deposited into your account. Get Paid For Your Opinions With Prizerebel Create Your Free Account Here!! This type of site would be ideal for anyone who is interested in taking surveys, watching videos and doing small tasks on their computer in their free time and getting paid for it. If you’re a stay at home mom or dad that’s looking for a way to help out your significant other with some extra money to pay bills then you may want to check out this system to see if it would be a good fit for you. If you happen to be reading this review right now and you don’t live in the countries mentioned above don’t worry you can still participate, but you won’t have full access to everything. Also if you’re the type of person who enjoys receiving gift cards for offering your opinions on some of the most controversial topics today then this opportunity could be a good fit for you. One of the things that really stood out to me the most as I was doing my research on this system was the fact that there is something for practically everyone no matter who you are or what you’re interested in. 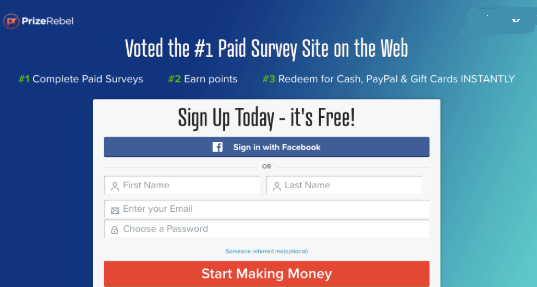 While taking surveys is the most common way for you to earn money with this site, there are a plethora of other ways to get paid from this site and I’ll be listing these for you guys below. Daily Challenges– Each and every day there is a new daily challenge that you’ll need to meet to unlock extra bonus points. These include things like earn 148 points in 1 day or reach a certain level by the end of the day. Offer Wall- Looking to rack up points pretty easily? You might want to check out their offer wall to see what new and exciting offers await you. Some offers are free while others will require a credit card and these usually credits to your account shortly after you complete the offer. I have only touched on the most popular ways to earn money with this GPT site and there are quite a few other ways to make money with this site that you’ll discover once you create your free account and become a member. Whenever I review any type of potential make money online product or service I always want to be as transparent as I possibly can so that you guys know that I have personally tried this out for myself before recommending it to my audience. This is something that I need to work on and this is a personal goal that I have set for 2019. Anyway, I originally reviewed this back in 2016, and I did very little with it in terms of being active after I reviewed it. As I was checking my point balances and all the points that I had earned but lost due to inactivity, I was pretty devastated, to say the least. If you’re inactive for 6 months or more you’ll lose a lot of your points as well as other perks that you may have acquired before you were inactive. Just the other day I decided to log in and take a few surveys because I had a couple hours to kill. Just in 1 day alone, I was able to earn upwards of $6 within less than 2 hours and that’s not bad at all if you ask me. Take a look at the screenshot below of my earnings from yesterday 12/27/2018 and tell me what you guys think? That’s about $4.00 in points not to mention the fact that I also unlocked $5 in PayPal cash in addition to having these points awarded to me. If you were to add these 2 things up it would be equal to roughly $9.00 for only a couple hours of taking surveys and offering my opinions on many of the things that are going on in the world today. If I were to devote more than a couple of hours to this then it’s hard to tell how much I could earn here. It’s important for you guys to keep in mind that you aren’t going to earn enough money taking surveys and doing other odd jobs here to quit your J.O.B so don’t even think about that. However, if you have a few hours to kill and you’re bored or need something to do, I would highly recommend Prizerebel as a legitimate side hustle. If I was able to earn $9.00 within 2 hours, how much could you earn within that time slot? How Does Their Membership Levels Work? There are a variety of different membership levels that you can work towards once you actively start referring your friends and family members to this and I’ll be listing these for you guys below. Each and every member who joins Prizerebel will start out at the bronze level and move up from there. As you guys can see above, the higher level you are, the more perks that you’ll unlock. Typically you’ll need to reach Gold status before you start to unlock any type of bonuses or high-level perks. If you’re looking to double or possibly triple your points why not tell your friends a little about what you’re doing and invite them to join you? 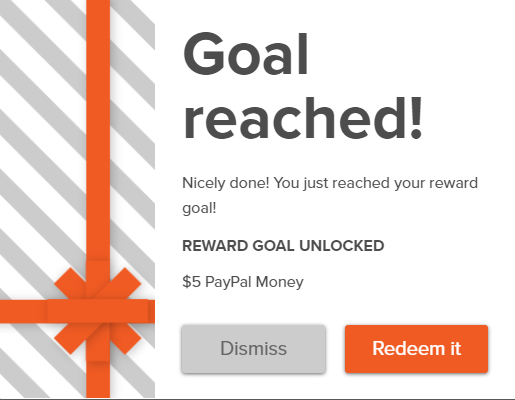 For each member who joins through your unique referral link, you’ll get a 25% cut of their points once they start earning points and becoming an active member of the growing Prizerebel community. Also, as you reach higher levels these percentages will obviously go up, but I think you guys get what I’m trying to say don’t you? In order for you to utilize this to its full potential, you would need to write up a pretty lengthy review of this system like I’m doing at this very minute. You would then need to build an active list of referrals who actually log in and take surveys on a regular basis. The people that login when they first sign up and act interested only to find out that they quickly lost interest and moved on to the next best thing. These are the types of people that you need to avoid when finding your targeted audience that would be interested in earning some free gift cards or some free cash for offering their opinion. Could you imagine having multiple 100+ points coming in at all times? That would be pretty sweet if you ask me, wouldn’t you guys agree? 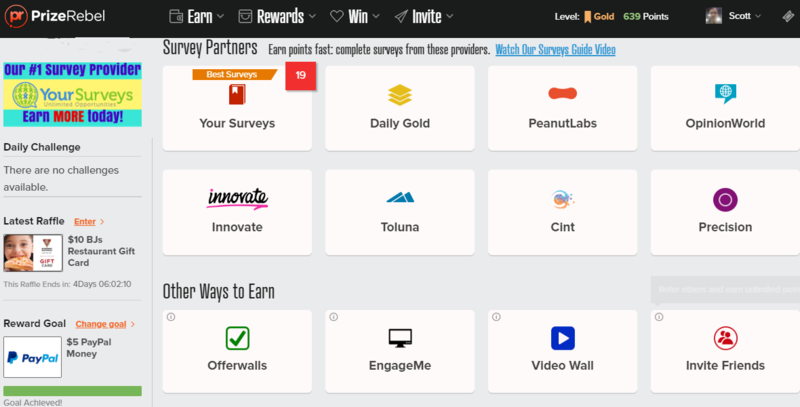 Once you have taken a number of surveys, referred a few good buddies of yours, or have completed a few offers from the offer wall, you may be wondering what rewards are available to you as a member? One of the many things that I particularly love about this survey panel is the fact that there are a variety of compensation options at your fingertips. 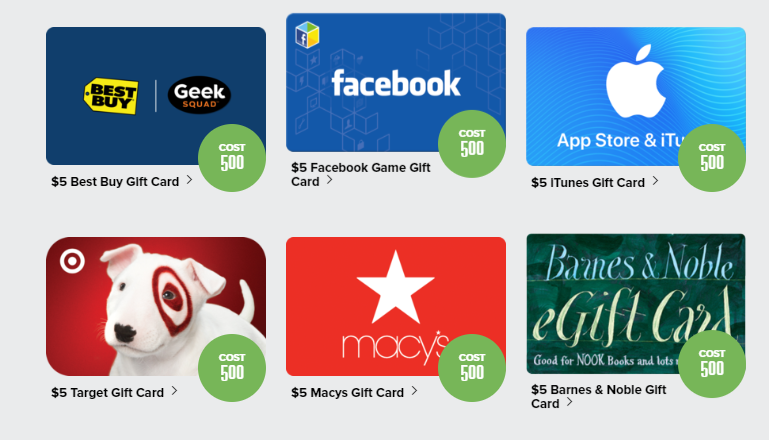 As you can see there are a variety of options for you to pick from when it comes to redeeming your points for either gift cards or cold hard cash. I have actually just cashed out myself just a few minutes ago (Dec 28th, 2018) so once I receive my payment, I’ll be updating this post. This will include screenshots and the whole nine yards to prove that they do actually pay!! If you choose the PayPal option then you’ll need to verify your PayPal email address with them beforehand to avoid any issues with them sending money to the wrong account. Also, your first time cashing out, your payment is usually processed within 24 hours. However, after your 2nd payment, you can expect to receive your money within an hour or sometimes less. If you choose to go with the gift card option these are sent electronically to the email address you registered with so make sure you sign up using legit information. Gift cards are usually processed within 72 hours but you’ll usually find these arrive in your inbox overnight or in some cases within a couple of hours. This is the part of the review that I’m starting to look forward to as I enjoy sharing the success that I’ve had with these past couple of survey panels by providing you guys with payment proof that these type of sites do pay. Check out the screenshot below for all the details!! Since this was my first time cashing out and I’m a gold member I received this payment in about 24 hours from the time I requested it. When I go to cash out the next time, this will be processed in under an hour and the payment should go directly to my PayPal account in about an hour. I told you guys I would be updating this post once this payment hit my account. It did take me a little longer than that to update this review with payment proof. This is mainly due to the fact that I’ve been extremely busy lately and just remembered as I was scrolling through this post that I needed to update it. Is Prizerebel Really Worth Your Time? This all depends on you I guess and what type of person you are. If you’re a stay at home mom or dad looking for a way to earn extra money for taking surveys and offering your opinion on many of the pressing topics in the world today then I would say most definitely YES. The fact that I was able to earn $9.00 in my first 2 hours should speak volumes about the true potential thats available with this system. While it’s not possible for you to quit your job and earn a full time living taking surveys, this isn’t a site that you should overlook cause I do see lots of potential here. Anyway, I really hope that this Prizerebel review has given you an in depth look at what this system is all about and what you would be doing if you were to join and become a member. Questions, comments, or something you would like to add to this review? I would love to hear all about it and answer any additional questions that you may have in the comments below. Do you have a personal experience you would like to share with everyone here today? How long did it take you guys to initially cash out? Also, how much were you able to earn in your first 2 hours? Hi Scott and thank you for such a detailed and in depth review of Prizerebel. I have been taking surveys from various panels and have been earning decent money with them. However, It wasn’t until I stumbled upon your PR Review that I was able to learn about all the awesome benefits that await you when you decide to become a member of the PR community. I live in Guam which is a territory of the United States but whenever I go to create an account I’m presented with an error msg that says my country isn’t supported and I’m unable to join at this time. Since Guam is technically a part of the United States do you have any idea why I keep getting this msg when I try to sign up? Also, what if we don’t have a PayPal account or it’s not available in your country? You also mentioned that people who aren’t from the countries you mentioned above could still join but wouldn’t have access to the entire site. What features would be blocked for those of us who don’t live in the countries above? I look forward to your insightful response Scott and I hope you can answer these questions for me and help me get started on my Prizerebel journey with your guided assistance of course. I’ll be looking forward to your reply and I’ll chat with you soon. Thank you so much for stopping by today and sharing the success that you’ve had with various other survey panels and for your interest in joining the Prizerebel community. I’m sorry to hear that you’re having issues joining this survey panel and I’ll be addressing your questions below. I personally don’t know why you would be having issues joining from Guam because I have a buddy of mine who lives in Guam and he was able to not only sign up for an account but also earn money taking his first couple of surveys. If I was you I would contact the PR support team and explain your situation to them and see what they have to say about it. If you continue to have issues joining then they could possibly set up an account for you and send you the login details to your email inbox. However, there is also an alternative to PayPal if you would rather use a different online financial institution and that would be to receive your earnings via Dwolla instead. If you were to join from another country that isn’t supported then you would likely not be able to complete surveys or participate in the daily challenge. As far as the rest of the site you should be able to access most of the other features associated with this site but don’t quote me on this cause I’m not 100% certain about this. I really hope this has helped answer your questions about PR and provided you with the answers you were looking for. I would love it if you would report back here and update me on whether you were able to successfully create your account and get around these issues that hindered you from joining. I hope you’re enjoying your weekend Michelle and let me know how this turns out for you. PrizeRebel is one of the best rewards sites I know. They have paid me twice without any hassle. I also redeemed my points for PayPal gift card today, let’s see how long it takes.